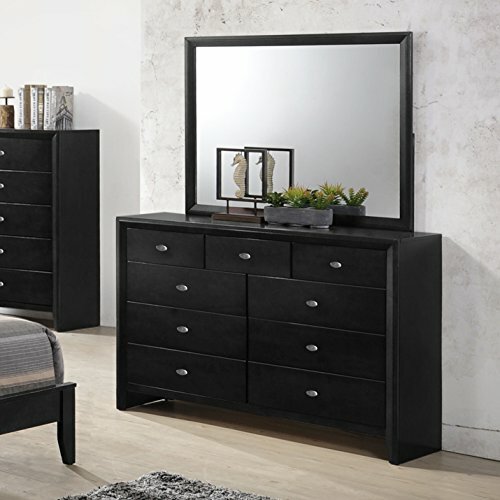 This beautiful wood black contemporary dresser and mirror makes a stunning addition to any bedroom in your home. It has a straight-line style that's complemented by the brushed metal pulls. With 9 drawers, this dresser offers plenty of room for your entire wardrobe. Each drawer moves easily on metal guides with safety-stops. The Gloria black finish wood 9 Drawers Dresser can complement any room's existing décor in spectacular fashion. This generously-sized bedroom organizer possesses hewned edges for a salvaged wood look and rustic appeal that's sure to impress. It holds nine pull-out drawers fitted with metal handles, and is available with or without a matching rectangular wall mirror featuring an expansive reflection and thick wood frame. Full-extension, smooth drawer glides ensure easy opening and closing. This lovely dresser makes a great addition to the rest of the Gloria bedroom furniture collection. Dresser Set up Dimension: 55"x16"x38"H; Mirror Dimension: 45"x35"H. Some Assembly Required.